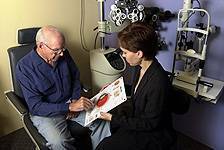 All of our Roslyn and Manhattan eye doctors are licensed and certified to diagnose and treat a wide range of conditions related to your eye and vision health, ranging from sudden onset problems such as eye infections (conjunctivitis or "pink eye"), foreign bodies or allergy, to chronic problems such as dry eye. We are pleased to be among the first sites in the U.S. to provide a revolutionary new technology for the treatment of chronic dry eye related to tear film evaporation. The Lipiflow® thermal pulsation system is an in-office procedure providing quick, non-invasive and long-lasting therapeutic management of the root cause of most dry eye. It applies gentle heat and massage to the oil producing (meibomian) glands of the lids to clear blockages and stimulate healthier production of the lipid layer of the tear film. It is this layer which protects the tears from evaporating too quickly. This simple, painless procedure can offer appropriate candidates more significant relief from symptoms of dry eye while reducing the dependency on lubricating drops and prescription dry eye medications. For more information on this innovative treatment go to www.tearscience.com. We also offer post-operative care for patients undergoing cataract and laser surgery. Treatment may include medication and/or supportive care. Follow-up visits to monitor your recovery will be scheduled as needed. Our close ties with top cornea, glaucoma, and retinal specialists throughout the Tri-State and Long Island areas as well as around the country, allow us to facilitate referral for further evaluation and treatment should it be required. Chronic systemic health conditions such as diabetes and high blood pressure necessitate yearly comprehensive eye exams to monitor for ocular side effects. Eye diseases such as glaucoma, cataracts, and macular degeneration are, likewise, detected and followed through on-going periodic examination. Problems such as pain or injury or the sudden awareness of floating spots or flashing lights require immediate evaluation. In cases such as these, please call our office number (staffed 24/7) so that we may evaluate and manage the condition in a timely manner. Our administrators will work with you to schedule an appointment as soon as possible. Through our ongoing investment in state-of-the-art equipment as well as retaining one of the highest caliber and most knowledgeable staff, our Roslyn and Manhattan optometrists are prepared to attend to the urgent needs of yourself and your family with our usual and customary dedication to comfort, excellence, and quality of care. We proudly serve patients from the 5 boroughs of New York City, the Tri-State Area, and Nassau and Suffolk Counties on Long Island, with offices conveniently located on the Upper East Side of Manhattan and Roslyn, NY. Laser vision techniques and instrumentation continue to evolve and through our close affiliation with TLC Laser Eye Centers we know that nobody does it better! Tired of wearing your spectacles and contact lenses? This may just be the right time to take the laser plunge!